We have been playing around with Ma's new "toys" that she received for Christmas...a macro lens and a fisheye lens for her iPhone camera. I, of course, offered to help her learn how to use them since photo shoots = treats! I hope everyone received some well-deserved treats and toys this holiday! Thank you to Sugar the Golden Retriever and Dachshund Nola for hosting another great Black and White Sunday hop! Nice gifts! I am still wishing for a new lens. 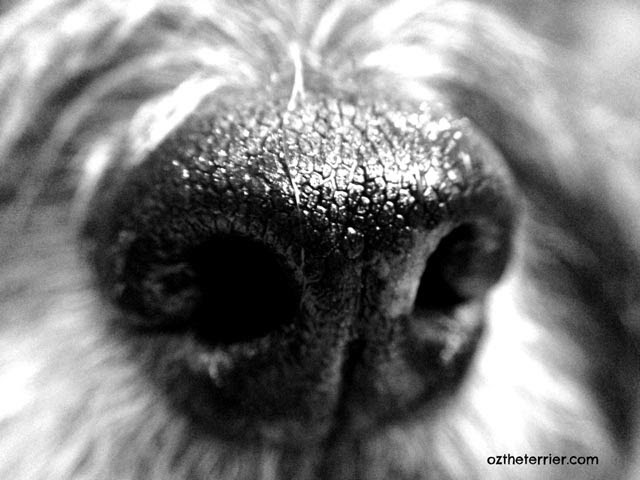 the macro lens rocks, I can even see the things you smelled with your nose! Wow! Always fun to get new toys, no matter who you are. Ma is sure doing great with those new toys Oz! The macro lens will have photos that will take up the whole post. Have fun with your new lenses. Great photos! Cool new toys! Our mom got a new camera, but she has been trying to figure out her new phone first! Cool new toys!! Do you get to chew on them at all? Or just wait for treats!? BOL! Hey! My Mom has an iPhone 6 and she didn't know you could buy those for the phone! Those are SUPER COOL!!!! Great shots! Mom loves to play around with her camera too, but hates her phone camera. 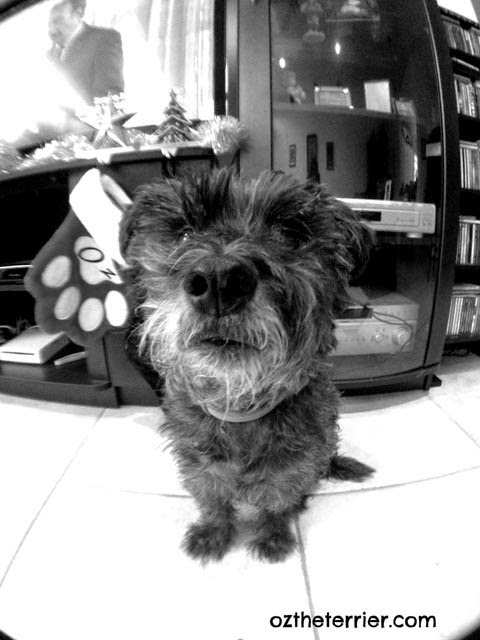 Interesting to use the fisheye lens. In real estate that is to be avoided, so Mom has never considered using it but it could be fun for dog stuff. Enjoy and really enjoy those modelling treats! Hey, anytime treaties are involved....I am IN!! What a fabulous snooty picture! You are such a great helper Oz! Wow, we could really see your nose good! Our pawrents have stopped using the HBO words. Mom said it isn't that the window is bad (how can a window be bad anyway?) it's just that she had to learn a new window. What is she talking about? Anyway, now I can use the touch paw screen and I am going to SKYPE Ruby on Monday. Cool photos, Oz!!! Being a model is a pretty good gig, isn't it? You are a great model for your mom's new lenses. Love these! I SO need a new camera. I am stuck using my cell phone, and it is definitely not the greatest!